How can you create video visualizations in Matlab? Create some basic video visualizations. Change the filtering of the motion analysis. Videos can be watched as they are, but they can also be used to develop new visualisations to be used for analysis. The aim of creating such alternate displays from video recordings is to uncover features, structures and similarities within the material itself, and in relation to, for example, score material. Three useful visualisation techniques here are motion images, motion history images and motiongrams. In the following we will try this ourselves, and look at the different types. The easiest way to get started with analysing video with MGT is by just running the function mgmotion. In Matlab you need to ensure that you are in the “examples” working directory. We will examine each of these in a little more detail. The end result is an image where only the pixels that have changed between the frames are displayed. This can be interesting in itself, but motion images are also the starting point for many other video visualisation and analysis techniques. A motion video is a series of motion images, each showing only the motion happening between the two last frames in the original video file. Here we output to a compressed .MP4 file, which is a great format for video that is primarily meant for watching (not further analysis). Here a filter setting of 0.2 is used instead of 0.1. The number goes between 0 and 1, where 0 will let through all pixels, while 1 will only let through completely white pixels. The default setting is 0.1, and this usually works quite well for most videos. If you want more detail you can try setting it down to 0.05, or if you have too much noise you can raise it to 0.2 or 0.3. Please note that every time you run the mgmotion function on the same file, it will overwrite the output from the previous run. 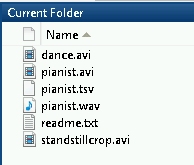 So if you want to keep differently filtered versions, you need to rename them. It may also be beneficial to copy the output files into a separate folder in which you specify the different settings you used. which will tell you about the different options and settings. While a motion history image may reveal information about the spatial aspects of a motion sequence over a fairly short period of time, it is possible to use a motiongram to display longer sequences. This display is created by plotting the normalised mean values of the rows of a series of motion images. The motiongram makes it possible to see both the location and quantity of motion of a video sequence over time, and is thus an efficient way of visualising longer motion sequences. A motiongram is only a reduced display of a series of motion images, with no analysis being done. It might help to think of the motiongram as a display of a collapsed series of pictures, or “stripes,” where each “stripe” summarises the content of a whole motion image. Dependent on the frame rate of the video file, motiongrams can be created from recordings as short as a few seconds to several hours. 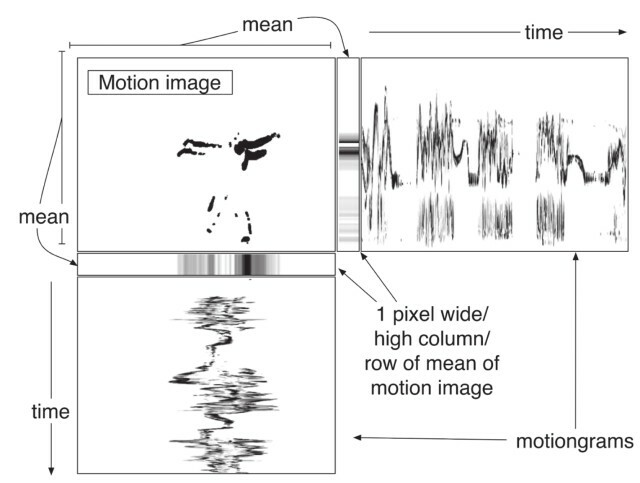 For short recordings it is possible to follow detailed parts of a body, particularly if there are relevant colours in the image, while motiongrams of longer recordings will mainly reveal larger sections of motion. Motiongrams work well together with audio spectrograms, and other types of temporal displays such as graphs of motion or sound features. Here the first column contains the quantity of motion (QoM), which is the sum of active pixels in the image. The two next columns include the x and y values for the centroid of motion. The exported plot dance_motion_com_qom.eps gives you an idea of how the data looks like. The data are also available for further calculation and plotting (as we will get back to later). 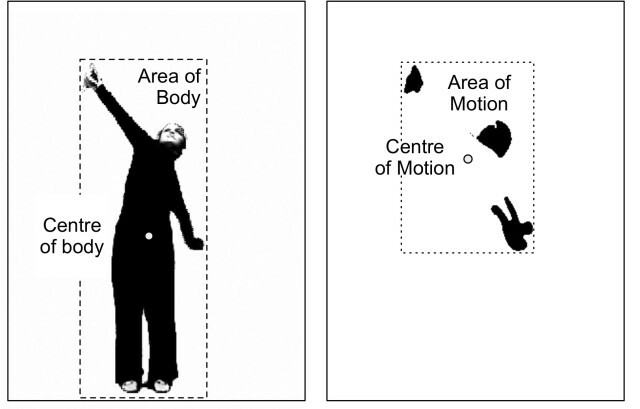 The centroid of motion (CoM) and area of motion (AoM) are other basic features that can easily be extracted from a motion image, and the differences between them are illustrated in Figure [fig:37-com]. The CoM and AoM features can be used to illustrate where in an image the motion occurs as well the spatial displacement of motion over time.